I am doomed. As we celebrate the arrival of a new year, it suddenly struck me this week that 2018 will be the last for me. That’s because in 2017 I turned 55 and while there are some good things about that age (if I knew then what I know now), and some bad (seeing a naked woman lying on the bed surrounded by candles now makes me think she’s performing some sort of Satanic ritual), the fact is this is the last year for me. The last year I will be a member the all so coveted 18-55 demographic. For those who are unaware, in marketing and advertising, the 18-55 demo is the most important; the Holy Grail, the age when people normally make the most money, and spend the most. However, after 2018, I will no longer matter to advertisers; they won’t care what I am interested in, what I’m buying, or anything else I imagine. So then, while I still can, in the final hours of my 18-55 relevance, I wanted to point out a huge marketing gaffe made by one of the largest auto makers in the history of the world, ever. 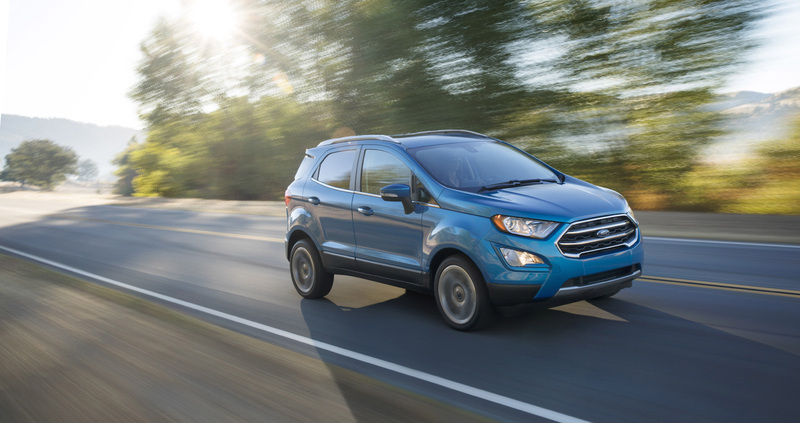 Last week the well-meaning folks at Ford sent me a brand new to America compact utility vehicle, the EcoSport. We Americans have had the Escape, the Edge, Explorer, Flex and Expedition for some time now. 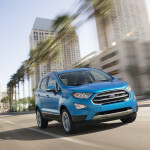 But the EcoSport, built on the Fiesta platform, was only available overseas, Europe and India primarily. But for 2018 the EcoSport gets a facelift and a whole new market. There’s three inches added to the overall length (158.2-161.3), on the same wheelbase (99.2 inches), and an inch added to the width and height. One big thing missing from the American version is a full size spare hanging on the back door; though it does still open sideways which is sort of funky. Yes, there’s new headlights, front and rear styling tweaks and a larger front grille. But since those of us in America have never really seen an EcoSport, none of that matters. There are four trim levels, S, SE, SES, and Titanium. The trims offer varying degrees of standard features and options. All trims can be had with either front wheel or all-wheel drive, and/or a 1.0-liter turbocharged EcoBoost I-3 or a 2.0-liter naturally aspirated I-4 under the tiny hood. The 1.0, available on front wheel drive only, has 123 horsepower with 125 lb-ft of torque, while the 2.0, four-wheel drive only, has 166 hp and 149 lb-ft torque. Both use a six-speed automatic. This new EcoSport is of course gadget friendly, with two USB ports, two 12-volt outlets, and you can get a 110-volt plugin in the back. 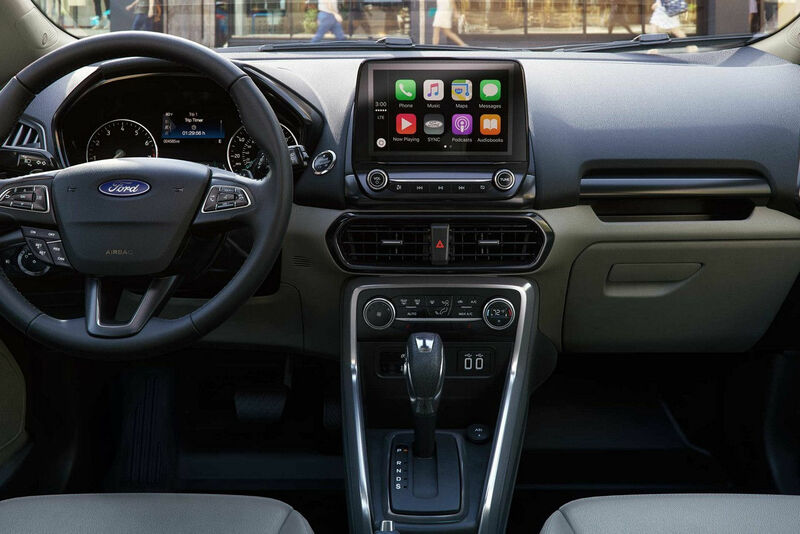 The optional 8-inch screen “floats” in Ford-speak in the center of the dash with the Ford Sync 3 used to control everything. 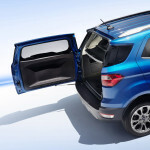 The interior is indeed small, this after all is the smallest SUV Ford has; like an Escape that has yet to reach puberty. One of the first things I noticed about the interior are the storage pockets, Ford says there are 30 and I think I found them all. Despite its mini size, I didn’t find the cabin confining at all. The adjustable rear shelf fit in nicely with the folded down rear seats allowing a weeks worth of groceries to fit without effort. I had the Titanium with the 1.0-liter EcoBoost, and despite some misgivings, there was plenty of power on the road. I even took my family of four adults on a two-hour road trip. I was a bit nervous starting out, after all a compact isn’t something known for comfortable long highway trips. Surprisingly however the space was adequate, the ride reasonably comfortable, and even loaded with four adults the 123 horses never even hiccupped. 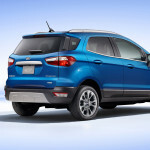 You see this new EcoSport is being marketed to the younger side of the 18-55 demo. 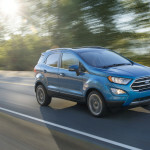 Ford is offering the EcoSport in 10 exterior colors and seven interior ambient light choices to appeal to the picky millennial; and opened a show case in Hollywood where hipsters can go to take selfies, post on Snapchat with a special geo-filter and listen (and dance) to live music. Things those of us on the other end of the demo sort of scratch our balding heads at. So the new EcoSport is supposed to appeal to the youngsters, the youthful generation that likes all things small and techy. However, this is one old guy who really likes this new compact SUV. The 10 speaker 675-watt B&O Play audio system by Harman, with door-mounted tweeters and a rear subwoofer, sounds great, and while us older ones could care little about things such as Apple CarPlay and Android Auto smartphone, or Snapchatting, we do care about a well-made small vehicle that had all the things I like; satellite radio and navigation, for example. It also had blind spot monitoring and rear cross traffic alert. All for a price well under $28,000. In fact, my Titanium tester priced out at $25,740, and at that price it’s nothing short of brilliant. 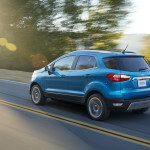 My entire family, and I, came away impressed with the new EcoSport. For the price it will definitely be a player in the compact SUV market, no matter your age. Of course, a few days from now, no advertiser or marketer will care what I say. Now you kids get the hell off my lawn. Engine: 1.0-liter Intercooled Turbo I-3. 123 hp @ 6000 rpm, 125 lb-ft torque @ 3500 rpm. Vehicle height (without options) (in. ): 64.